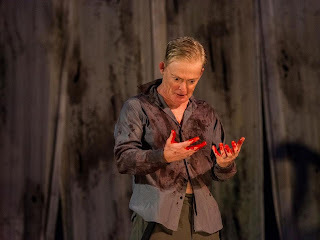 Long have I laughed off the wackily superstitious notion that you're not supposed to say "Macbeth" in the theater unless you're in the midst of performing the play. In other words, if an actor or, um, Shakespeare professor says "Macbeth" in the theater during rehearsals or while just milling around, some bad stuff is gonna happen. Obviously I should have said "The Scottish Play" and "The Scottish King" and all that because last week the bus that was supposed to take my students to a production of Macbeth departed fifteen minutes early and left a large group of them behind. Yes, I eventually got the bus driver to turn back and retrieve them (via cell phone), but not at the expense of our general angst. I could go on, but I won't. All I'll say is that, while holding my breath for my students to arrive at the performance, Macbeth's problems seemed pretty small by comparison. It's all about perspective, you know? This is where we bring Shakespeare down from the Ivory Tower and into our everyday lives. We’re both suburban moms and Shakespeare professors. 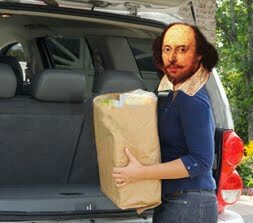 For us, the Bard isn’t some genius you haul out for weddings and graduations. He’s our snarky friend, our confidant, our therapist, and our partner in parenting. He’s a useful guy to have around. Stick around, and you’ll see what we mean. We survived the weekend! This is where we vent about it. The Norton Shakespeare answers our most burning questions. We just close our eyes, point to a passage at random, and interpret the magic answer! Staff members and guest contributors rant and rave about everyday issues. Shakespeare is everywhere. Have you seen him? Poems and other goodies made from scratch. "Is the Husband Going To Be a Problem?" Holocaust Fiction: Is Realism Paramount?